On a cold 1970 winter day at Madrid’s Torrejon Air Base Boy Nav Bondo hopped off his C-133A in mid-mission to take a westbound C-141 jumpseat back home to Dover AFB, Delaware, there to prepare for a short notice move to TAC recce fastmovers. In my excitement to join the “down-in-the-weeds-with-your-hair-on-fire” community a continent away at Mountain Home Air Patch, Idaho, I never looked back to properly reflect on the faithful, little-known Douglas airframe that had carried me safely throughout the world for fifteen hundred hours in eighteen months. Although it’s now been thirty-five years since these unique heavy haulers went away sans fanfare to the AMARC “chop shop” in Tucson, retired navigator Cal Taylor’s lovingly-written tome (420 pages!) brings back so many memories to this curmudgeon that my departure might as well have been yesterday. Cal has divided this hefty book into some twenty-four chapters, leading the reader from post-WWII airlift development through design and flight test of the C-133, aircrew training, squadron organization–there were only three units, two at Dover and one at Travis–maintenance difficulties, Vietnam operations, crashes and incidents and, finally, civilian usage; yes, as recently as 2004 there still seemed to be an operational Weenie Wagon in Alaska! For readers not familiar with the C-133, imagine the ubiquitous C-130, and then enlarge it by roughly fifty percent! For almost all of its fifteen year operational career, just fifty of these giant birds fulfilled the heavy airlift requirements of the Department of Defense. That’s right, just fifty were built, and now comes the really tough part: nine were lost, and one was wiped out in a ground incident. Even so, Cal points out that the type’s overall safety record compared favorably with those of other USAF aircraft. Statistics or no statistics, the aircraft became somewhat of a PR disaster and was grounded at least two times in the first few years of flying. In fact, when I related to one person that I had been a C-133A aircrew member, the guy exclaimed, “Wow, and you’re still alive!” A little MAC black humor digression: in the flight planning room at Wake, the C-133 fuel manual had been inscribed on the cover with a cross and “For Underwater Use, see MAC Manual____” . You see, less than two years prior, a Weenie Wagon was lost on takeoff there, killing the entire crew, the wreckage settling into water fourteen hundred feet deep. The most enjoyable sections of the book are the personal aircrew accounts and fourteen pages of color plates. In the interests of full disclosure, Bondo’s recollections are included among those tales. My favorite color pic is a photo of the famous-but-long-gone Drifters Reef at Wake. The rustic, Gilligan’s Island-type aircrew bar was located right on the beach of the inlet that flowed in from the vast Pacific to the lagoon where Pan Am had moored its legendary Boeing Clippers seven decades ago. One could carry a wooden lawn chair right to the water’s edge and sip a cool one while watching sea birds and beautiful ocean sunsets. Some of us had the numbers on the video jukebox memorized. I especially remember “Monday, Monday” and the hot French babe who would perform some of the onscreen numbers. A “small world” story: We were buying our carryout liquor ration at the Wake Class VI store when I noticed that an aircrew member standing in line in front of us looked strangely familiar. I approached him, and we both did a shocked doubletake; it was a high school classmate and friend who was flying reserve 130s. We hadn’t seen each other since graduation, twelve years prior. 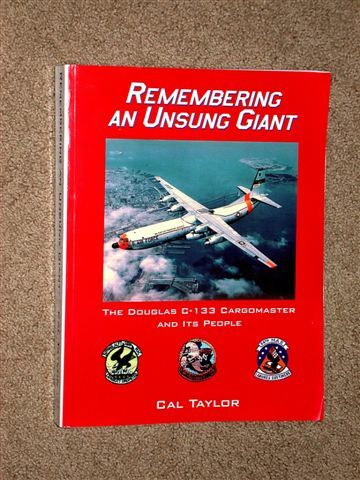 Cal covers the crashes/losses/incidents that plagued the 133 fleet in great detail, giving the reader the proper respect for the uncertainties and danger that stalked each airlift mission. “Hours of boredom interspersed with moments of stark terror” was the watchword, such as when all four props would inadvertently go into “fixed pitch” and the resultant horrendous torque needed to turn them as the aircraft descended to thicker air would flameout the T34 engines, just like lugging your stickshift vehicle up a hill in forth or fifth gear. Although flying TAC fastmovers was so much more exciting to Bondo than MAC “bus driving”, I couldn’t agree more with Cal’s statement that airlift operations taught us invaluable self-reliance. When you, as the nav, haven’t had a good position–what’s an Inertial Nav System? ?--fix for hours, and you’re DR-ing on a twelve-hour leg over the night vastness of the North Pacific from Kadena to Midway, with NO alternate airfields, and the aircraft commander asks you “Where are we?,” you simply pound your fist on the chart and say, “Here.” Of course, the “footprint” of said fist covers an area of about five hundred square miles! Reading the names of C-133 aircrew members, some of whom this curmudgeon hadn’t thought of in over three decades, made me happy, sad, and wistful all at the same time. We had a common task, served with pride out in the MAC “system” and enjoyed the company our fellow 133 pukes in a small, tightknit flying “club”. Cal Taylor has done a masterful job in creating a fitting biography of this little-known and little-remembered one-time centerpiece of USAF airlift. It’s difficult to envision any future work that could flesh out the C-133 in more detail. We ex-Weenie Wagon troops are greatly indebted to him. Highly recommended!